Pronation or at least over-pronation is spoken of in running circles as though it is the bane mankind where is it is actually a completely natural and necessary movement and happens for a good reason. Pronation of the foot along with knee and hip flexion aids shock absorption through the first portion of the stance phase as we move. 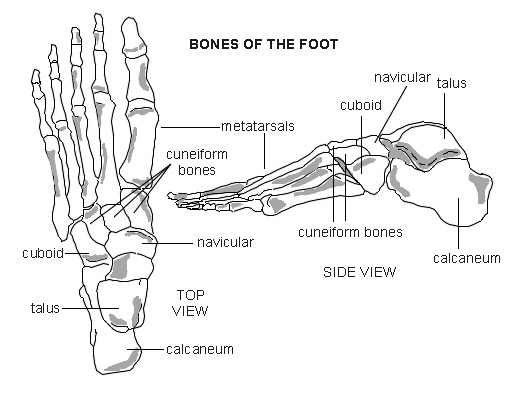 The foot is made up of the talus (forms the ankle with the tibia and fibula) calcaneus (your heel), the cuboids, navicular, cuneiforms, metatarsals (the long bones of the foot) and finally the phalanges (toes). There is movement at the joints between all the bones to a greater or lesser degree and the large movements we see are the sum of the movements at all the joints. So you can see that pronation of the foot is not a simple movement and occurs at the fore foot (transverse tarsal), mid-foot (talo-navicular) and rear foot (talo-calcaneal) so you really need to define where your problem is occurring assuming you are over pronating. If we look at what happens in pronation it is the sum of evertion of the calcaneus resulting in plantar flexion, adduction and eversion of the talus as it moves on the calcaneus. This is accompanied with dorsi flexion at the transverse tarsal joints, those between the calcaneus and cuboid and the talus and navicular. We then get internal rotation of the tibia which in turn creates internal rotation of the femur, anterior rotation of the pelvis then extension of the lumbar spine. As we can see there is quite a lot happening here and therefore the potential for things to go wrong in a number of places. When we are talking about over-pronation and how you are going to try and fix it a better approach to the problem than the standard one which seems to be motion control running shoes and orthotics might be to ask the question; “Why do I pronate so much?” The fact that you pronate to a greater, or lesser, degree than some ideal is not really what you should be concerning yourself with until you have found the reason why you are doing it, that is to say what within the foot, leg, hip or pelvis is causing you to compensate with a greater degree of pronation than is ideal for you. You may over-pronate or you may be spending too much time in the pronated position, perhaps due to how and where you strike the ground but simply looking to motion control shoes or orthotics to fix the problem is ignoring the fact that the pronation issue is most likely a result of other issues. Starting at the bottom if we get stiffness in any of the joints involved in the foot we will get compensatory movement in the other joints in the foot to make up for the deficit and thus more pronation. This compensatory movement is something that will be played out throughout all the joints involved in propelling us forward. At the other end if we are lacking internal rotation at the hip, not an uncommon problem given how we sit and the sedentary nature of most people’s lives, we will create more internal rotation of the tibia to compensate for this which in turn will create more movement in the foot itself. If we add lack of strength in the stabilising musculature of the torso and pelvis and given that a lack of strength in the musculature around a joint is often the reason for the lack of range of movement in the joint you can see how a pronation issue in the foot can be a hip/torso issue. Many people live very sedentary lives and this can contribute to the loss of strength in the glutes which has a direct effect on their ability to both stabilise and move the hip. Sitting for long periods can also cause the stiffening of the tissues of the anterior hip and and further affects their ability to extend the hip. On top of this when they are sitting people often sit with the hip externally rotated for long periods resulting in a reduction in the ability to internally rotate the hip through the changes in tissue quality. All this can add up to a pronation issue in the foot that is the one that is often fixated on, ignoring the fact that it is a symptom of other issues further up the chain. Sitting for long periods can also cause issues in the ability to recruit the abdominals further compounding pelvic, hip and torso stability. So as we can see pronation issues in the foot are rarely, if ever, going to be fixed by buying new shoes. Orthotics will help fix the issue where there is a congenital problem or a deformity as a result of injury. For most people though the solution lies in getting those areas that are stiff/weak working again so that they can do their job properly and that simply requires identifying the problem areas and a bit of time and effort spent of addressing the issues found. This also applies to those with congenital issues as the orthotics alone will not fix the issues upstream of the foot and ankle.